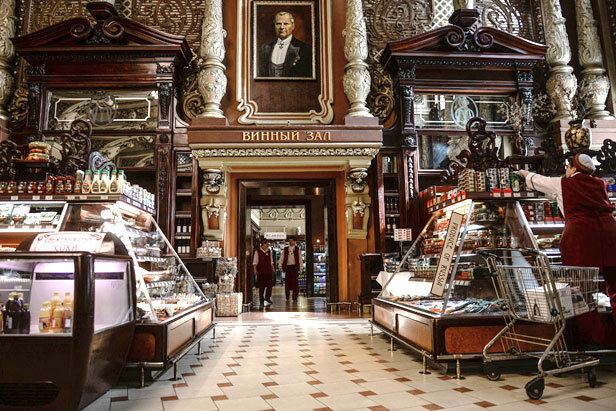 Yeliseyevsky, one of Moscow's oldest grocery stores, is celebrating its 115th anniversary. Grigory Yeliseyev, the founder of the store, was one of the country’s top businessmen in the early 20th century. His luxurious food halls in Moscow and St. Petersburg survived Soviet times and are now open again after reconstruction. In 1901, the newly opened Eliseevsky store amazed Muscovites with its rich and exotic product mix. The glitz of the new grocery, sited in a historic 18th century building on Tverskaya Street in central Moscow, embodied the might of the Eliseev trading empire. The Eliseevsky store was a firm favorite among the Russian nobility for its wines imported from Portugal, Spain and France, not to mention the exotic fruit and exquisite cheese. Alongside GUM, today Eliseevsky is one of the Russian capital's most prestigious historical centers of commerce. Eliseev Emporium in St. Petersburg opened in 1903 — just two years after its Moscow cousin. This food hall was even more fabulous. The store took up residence in one of the majestic empire-style buildings on Nevsky Prospect. The shop attracted numerous onlookers who just gazed at its finery. In 1917 Grigory Eliseev lost his business when the Bolsheviks nationalized it. He flew to Paris, where he died in 1949. The new-look Eliseevsky Emporium in St. Petersburg has been open since 2012. Its renovated interior resembles the original splendor of the early 20th century.